Deadline for submitting results: Monday, February 11. Did you know that Food Labels will soon be changing? On May 20, 2016, the FDA revealed that a new Nutrition Facts label for all packaged foods will be put into place. The new food label reflects new scientific information, including the link between diet and chronic diseases such as obesity and heart disease. The goal of the new label is to make it easier for consumers to make better informed food choices. When Will You See The Change? The date for purposed changed to take place is January 1, 2020, for manufacturers with $10 million or more in annual food sales. Manufacturers with less than $10 million in annual food sales will receive an extra year to comply-until January 1, 2021. Bolding the font for "Calories," "servings per container," "Serving size," and the number of calories in the "Serving size"
The footnote better explains what percent Daily Value means. It will read: "The % Daily Value tells you how much a nutrient in a serving of food contributes to a daily diet. 2,000 calories a day is used for general nutrition advice." "Added sugars," in grams and as percent Daily Value, will be included on the label. Vitamin D, Potassium Calcium, and Iron will be required on the label. Vitamins A and C will no longer be required but can be included on a voluntary basis. While continuing to require "Total Fat," "Saturated Fat," and "Trans Fat" on the label, "Calories from Fat" is being removed because research shows the type of fat is more important than the amount. Daily values for nutrients like sodium, dietary fiber, and vitamin D are being updated based on newer scientific evidence from the Institute of Medicine and other reports including the 2015 Dietary Guidelines Advisory Committee Report, which was used in developing the 2015-2020 Dietary Guidelines for Americans. Daily values are referenced amounts of nutrients to consume or not to exceed, and are used to calculate the percent Daily Value (% DV) that manufacturers include on the label. The %DV helps consumers understand the nutrition information in the context of a total daily diet. By law, serving sizes must be based on amounts of foods and beverages that people are actually eating, not what they should be eating. Package size affects what people eat. So for packages that are between one and two servings, such as a 20-oz soda or a 15-oz can of soup, the calories and other nutrients will be required to be labeled as one serving because people typically consume it in one sitting. For certain products that are larger than a single serving but that could be consumed in one sitting or multiple sittings, manufacturers will have to provide "dual column" labels to indicate the amount of calories and nutrients on both a "per serving" and "per package"/"per unit" basis. 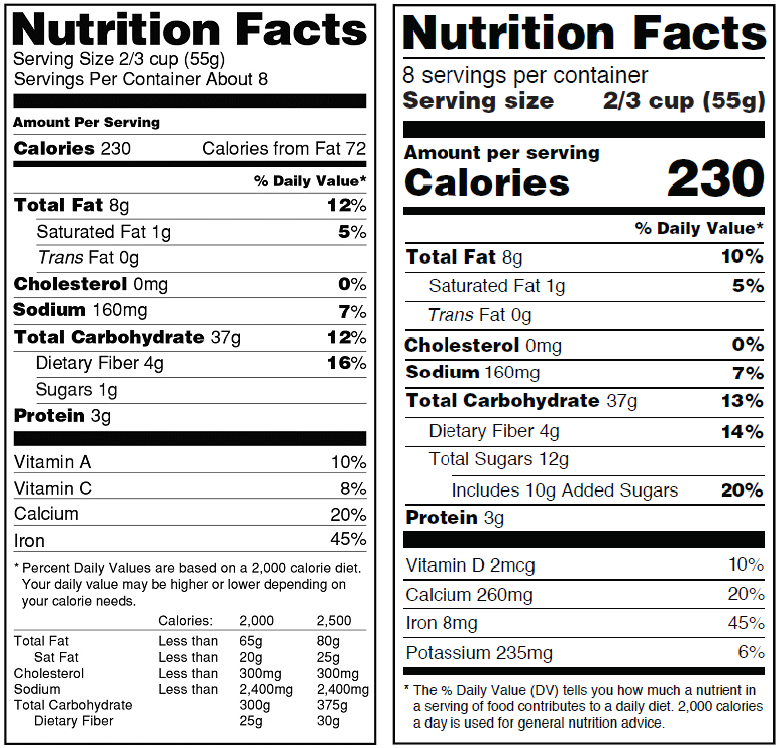 With dual-column labels available, people will have a better idea how many calories and nutrients they are getting if they eat or drink the entire package/unit at one time. Brighten up your meals by adding this week's featured colorful vegetable side dishes to your plate. The USDA recommends that adults consume at least 3 servings of vegetables every day. The standard serving sizes for most vegetables are 1 cup of chopped raw vegetables or 1/2 cup of cooked vegetables. Adding vegetable sides to your meals is a great way to help you in meeting your daily vegetable intake goals. This week we are featuring a RAINBOW colored selection of vegetable side recipe ideas. Start by picking your favorite color vegetable and dig in!